In the introduction to Schwerpunkt Volume 15 (SP15, the latest annual issue of Schwerpunkt, editor Evan Sherry takes advantage of the round-numberishness of the issue to reflect on Schwerpunkt’s accomplishments, which as of then included 180 scenarios (not to mention 40 more in the four Rally Point packs published to date). He proudly notes that the combined Schwerpunkt and Rally Point scenarios are only 20 fewer than the combined scenarios from Avalon Hill’s ASL Annual and MMP’s ASL Journal. Moreover, these scenarios tend to be played, not merely resting in a binder somewhere. Sherry observes that about 10% of recorded scenario playings on the ROAR Web site are playings of Schwerpunkt scenarios. By any measure, these are true accomplishments. One accomplishment Sherry neglected to mention is that, with the apparent defunctitude of Critical Hit magazine, Schwerpunkt is now also the longest continuously published ASL magazine (and the only regularly published one). Given these milestones, it is perhaps timely to take a (brief) look at Schwerpunkt and where it stands today. Schwerpunkt occupies a somewhat unusual place in the ASL third party pantheon. It has been around a long time, and is well known to ASL cognoscenti (especially because each issue of Schwerpunkt is debuted at the ASLOK ASL convention in October each year). However, it is not that well known to more newish ASLers, primarily due to a distinct lack of marketing (the Schwerpunkt Web site is bare-bones and does not as of 2009 even have its own domain name; it does not accept on-line methods of payment; and does not have a strong presence with on-line retailers). As a result, many novice ASLers will encounter other third party products before they come across Schwerpunkt. Moreover, though Schwerpunkt is well known to veterans, sometimes it seems that it is a bit too well known. Perhaps because Schwerpunkt has been coming out each year so regularly (and always in the same format), some ASLers seem to take it for granted. Many ASLers, too, have dated impressions of Schwerpunkt scenarios; one still sees comments about Schwerpunkt scenarios being small, even though the trend for some time has been towards larger scenarios (though see below). 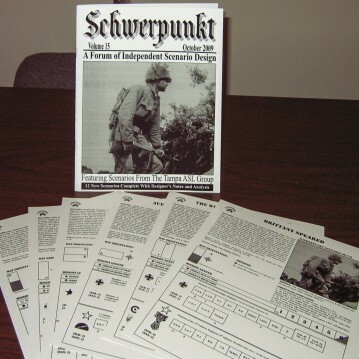 Though Schwerpunkt scenarios still enjoy a high reputation, an increasing number of ASLers seem to be placing Schwerpunkt as the number two third party producer, in terms of scenario quality, behind the Friendly Fire packs. One suspects that if Schwerpunkt took a year off on “holiday,” more people might appreciate what they were missing. Several people have commented that Schwerpunkt scenarios seem a bit too similar sometimes; one person wrote on an ASL discussion forum that “frankly I am starting to find their selection more of the ‘same old same old,'” and seemed to suggest that there were too many late war scenarios among Schwerpunkt’s offerings. The results of this tabulation are highly interesting. Now, in any large collection of varied scenarios, one would expect a greater weight on late war scenarios, simply because the war was so much larger in 1944-1945 than it was in, say, 1939-1940. However, even taking this fact into account, it is remarkable what a high proportion of Schwerpunkt scenarios are set in the last 18 months of World War II. The chart clearly indicates a strong bias on the part of Schwerpunkt towards late war scenarios. It is, moreover, a trend that has clearly increased over time (although Issue #14 temporarily reversed it somewhat). There are a number of campaigns that Schwerpunkt has barely even touched, or in fact covered not at all. Perhaps most remarkable is the dearth of East Front scenarios from 1941-1943, a period that other scenario designers have mined for material most profitably. Given this substantial late-war bias, it can be perhaps be seen how some people might legitimately perceive a certain sameness to Schwerpunkt scenarios. Now back to the (literal) issue at hand. SP15 continues the exact same format that all previous issues of the magazine have had. It consists of a short (24 page) black and white magazine and 12 black and white scenarios (with no counter artwork) on glossy cardstock. One wishes that Schwerpunkt might jazz up the scenario cards a bit, perhaps even trying a bit of color some day. 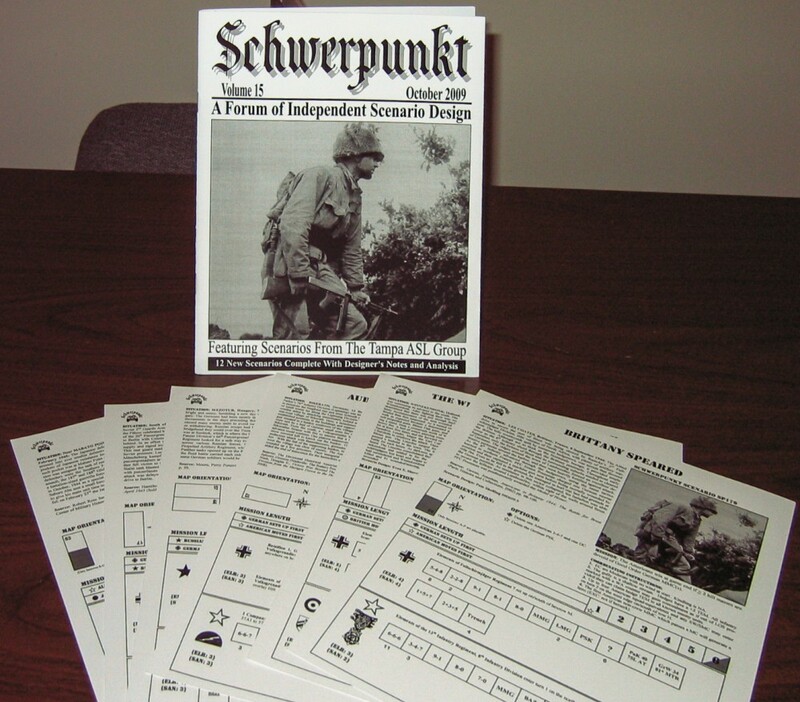 As is typical, the bulk of the magazine content is devoted to players’ and designers’ notes for the included scenarios; the magazine also includes a lengthy overview of Italian soldiers by Brook White. The 12 scenarios are, as noted above, heavily weighted towards late war scenarios. 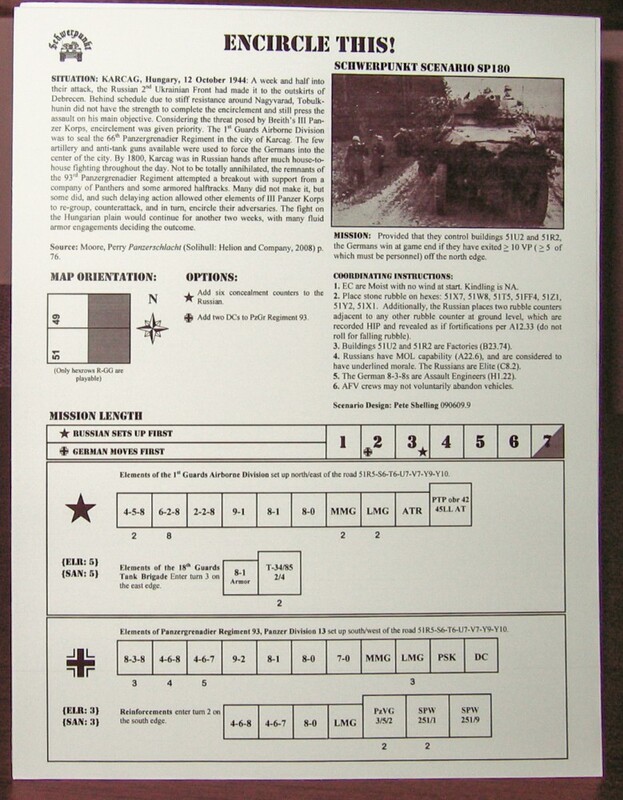 Indeed, SP15 contains only one scenario set before 1944 (it should be noted that there is no “relief” in Rally Point #4, released at the same time, as the theme of that pack is actions that take place in May 1945). Actions covered include Chinese/British vs. Japanese (Burma 1942), Americans vs. Germans (Italy 1944, France 1944, Germany 1944), British vs. Germans (France 1944, Holland 1945), Canadians vs. Germans (France 1944), Soviets vs. Germans (Soviet Union 1944, Hungary 1944 , Germany 1945), and Americans/Filipinos vs. Japanese (Philippines 1945). In terms of size, SP15 has a slightly better mix than last year; 3 scenarios are small in size, 4 are medium-sized, while the remaining 5 are largish. As is typical for Schwerpunkt, the SSRs tend to be few in number. Two scenarios have OBA, while none have Air Support or Night Rules. There is a substantial emphasis on using geomorphic mapboards from Action Packs #4 and #5; half of the scenarios utilize one or more of these boards. Schwerpunkt must have done something right with SP15; significantly more scenarios have been reported to ROAR from SP15 than from SP14. In fact, SP15 has almost as many scenarios reported as SP13 and more than SP12, even though those earlier volumes have been around years longer than SP15. It is always a good sign when a third party product’s scenarios show up being played on ROAR. Among the scenarios of SP15, a number seem to be quite balanced and interesting. SP178 (Chiang’s Finest) is a smallish, fun and playable Burma scenario (it is interesting to compare it to the very similar FrF37 [Crossing Swords at Kyaukse], released by Friendly Fire at the same time). Another good PTO scenario is SP177 (Tic Tac Toe), which pits the Japanese against a mix force of Americans and Filipinos led by a dangerous 9-2 leader. The tactical situation and the victory conditions give this scenario a bit of an interesting twist. SP176 (Smiling Albert) is a smallish action that pits five Tiger tanks against two American tank destroyers. Also worth trying are SP180 (Encircle This! ), the most popular scenario so far of SP15, as well as SP174 (Krupki Station) and SP170 (Halfhearted Hiwis). The biggest scenario in the pack is SP169 (The Winnekendonk Cakewalk); the OB is as much a mouthful as the title. In this scenario, a force of 17 British Elite and 1st Line squads, accompanied by a ton of AFVs (including 9 Churchills of various kinds, 6 Ram Kangaroos, and a lone Bren gun carrier) must capture a handful of multi-hex stone buildings (on boards 4, 53, and 57) from a German force of 12 squads, 3 StuGs, 2 50mm AT guns, and an 88mm AT gun. It has not been played very much to date, perhaps because of its size. Overall, SP15 seems to have a number of solid scenarios and ASLers have responded accordingly.